USDCAD stays in a bullish price channel on the daily chart and remains in the uptrend from 1.2782. 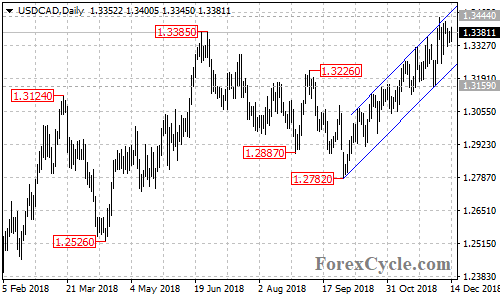 As long as the channel support holds, the upside movement could be expected to continue and next target would be at 1.3500 area. Key support is at 1.3159, below this level would indicate that the upside movement had completed at 1.3444 already, then deeper decline to 1.2900 area could be seen.